Authors are invited to submit complete unpublished Research work which is not under review or consideration in any other conference or journal in the following, but not limited to, topic areas. All tracks are open to both research and industry contributions. 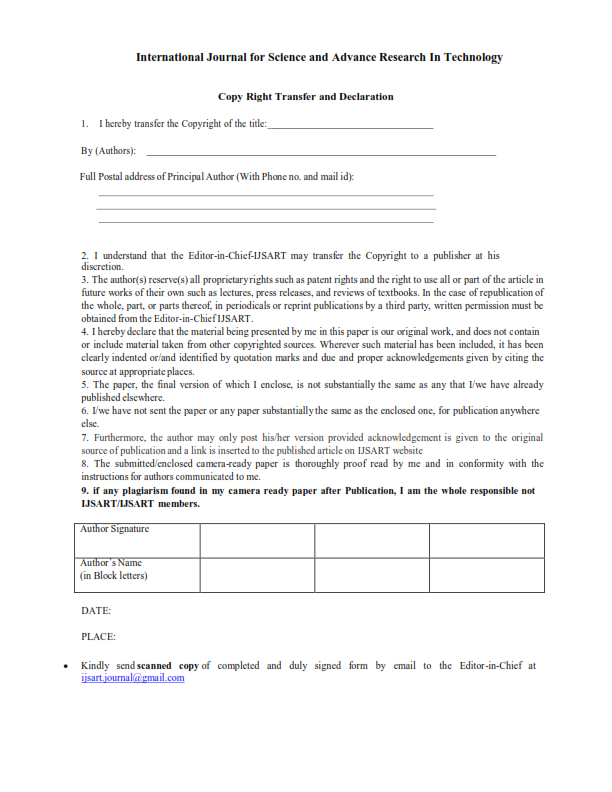 All authors must agree on the content of the manuscript and its submission for publication in this journal before it is submitted to us. Type of Articles Accepted: Research Paper, Survey Paper, Informative Article, Case Studies, Review Papers, Comparative Studies, Dissertation Chapters, Research Proposals or Synopsis, Post Graduate Programme Thesis. International Journal for Science and Advance Research in Technology (IJSART) is a Scholarly, Online, Fully Refereed and Peer-Reviewed International Journal. It is an interdisciplinary journal and issued regularly every month. It is fully refereed open access international journal focusing on theories, methods and applications in various branches of engineering and relevant researches in the field of Social work, Management, education, nursing, medicine, political science etc. It is an international journal that aims to contribute for the constant development and research in various streams of science, engineering and Management. International Journal for Science and Advance Research in Technology (IJSART) aims for the publication of quality research articles to flourish the entire education society by spreading original piece of knowledge. International Journal of Scientific Engineering and Research have the group of researchers and academicians who are committed to assist study and enhance aptitude by giving an aid for composing high caliber research papers through associate evaluation. International Journal for Science and Advance Research in Technology (IJSART) attempts its best to guarantee the variety in every research paper being published in International Journal for Science and Advance Research in Technology (IJSART). We publish articles that emphasize submission of original and unpublished articles which are critically review before they are published. Papers must be written in English and abide the rules of using grammar and terminologies. 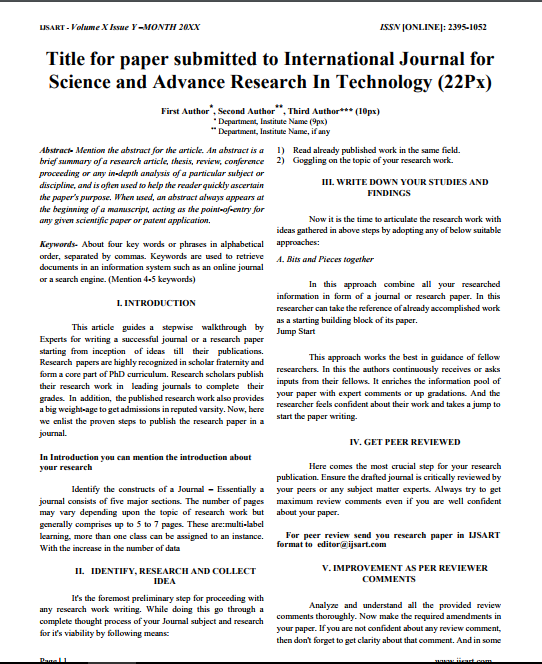 International Journal for Science and Advance Research in Technology (IJSART) follows Open Access as a publishing model. This model provides immediate, worldwide, barrier-free access to the full text of research articles without requiring a subscription to the articles published in this journal. In this model, the publication costs are covered by the Author / Author’s Institution or Research Funds. Published material is freely available to all interested online readers. At the same time, authors who publish in International Journal for Science and Advance Research in Technology (IJSART) retain the copyright of their article.